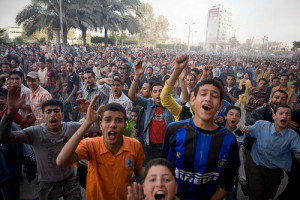 Major protests and riots in Egypt began a week ago today. Undoubtedly inspired by the recent uprisings in Tunisia, the current state of dissention has been a long while in the making. We have been covering the growing unrest in Egypt on the SixEstate blog for a few months now, along with the fact that the country’s social media movement is one of the largest in the Arab world. Social media — Facebook and Twitter in particular — is being credited with aiding protest organization efforts within Egypt. A cache of diplomatic cables relating to the Middle East was published in early December by the independent newspaper Al-Akhbar, and the leaks have been intensively discussed by Arab bloggers and political activists. Few subjects anger Egyptians more than their regime’s cooperation with Israel, and several leaked documents suggest just how closely the two countries’ diplomats and security forces work together. The cable sent in June 2009 from the U.S. embassy in Tel Aviv, which reveals that Egyptian officials were consulted about Israeli air and land assaults on Gaza the previous winter, must have been especially galling. Long lists of international numbers that connect to dial-up modems are circulating in Egypt[…] ISPs in France, the US, Sweden, Spain and many other nations have set up pools of modems that will accept international calls to get information to and from protesters. Many have waived fees to make it easier for people to connect. “By blocking the Internet and by attacking and arresting Egyptian and foreign journalists, the Egyptian government is trying both to prevent the protests from being organized and to prevent them from being covered internationally,” said Reporters Without Borders secretary-general Jean-François Julliard. Reporters Without Borders included Egypt on its Enemies of the Internet list as one of the worst violators of freedom of expression online. Protesters are circulating a list entitled “20 Ways to Circumvent the Egyptian Governments’ Internet Block“. The most determined are still finding a way to access the Internet, including Twitter. (Hashtags include hashtags #egypt and #jan25.) On The Two-Way blog, Andy Carvin, NPR’s senior strategist for social media, compiled a list of some of the top Twitter accounts with coverage of the protests. Carvin’s list includes columnist Mona Eltahawy (@monaeltahawy) and Al Jazeera correspondent Dima Khatib (@Dima_Khatib). Nick Baumann, who covers national politics and civil liberties issues for Mother Jones‘ D.C. bureau, compiled another list of online resources for following the story. To bypass government blocking of websites, use numerical IP addresses: Twitter ‘128.242.240.52’ [Facebook] ‘69.63.189.34’ Google ‘172.14.204.99’. A French ISP offers free dial up internet access ~ +33 1 72 89 01 50 Login password: toto. Please pass this on and share. One can’t help but wonder if a revolution of this size would have been possible before the advent of the Internet. Not only does the medium allow the spread of information to occur more quickly, but it’s also been an equalizer across class in Egypt, allowing for the organization of previous protests. A dissident’s social networking and Twitter feed is a handy guide to his political views, his career, his personal habits and his network of like-thinking allies, friends and family. A cyber surfing policeman can compile a dossier on a regime opponent without the trouble of the street surveillance and telephone tapping required in a pre-Net world. […] Since that revolt collapsed, Iran has become a cautionary tale. The Iranian police eagerly followed the electronic trails left by activists, which assisted them in making thousands of arrests in the crackdown that followed. The government even crowd-sourced its hunt for enemies, posting on the Web the photos of unidentified demonstrators and inviting Iranians to identify them. […] [T]he creators of the pamphlet explicitly asked that the pamphlet not be distributed on Twitter or Facebook, only through email or other contacts. We’re publishing this piece of ephemera because we think it’s a fascinating part of the historical record of what may end up becoming a very historic day for Egypt. My guiding principles were to stay away from the small amount of tactical information in the pamphlet. Instead, we ran the more general pages. There is nothing in these pages that goes beyond standard advice and broad political statements. Broadly, we were trying to balance the historic nature of the document and protest with the safety of protesters. Photo by James Buck, used under its Creative Commons license.